Planning learning with the end in mind is a time-consuming task, but the results are definitely worth it. As a teacher, you have a clear idea of what learners need to understand and be able to do, based on the standards, and hopefully, how those ideas, concepts, and skills apply to the real world so that students are motivated, engaged, and an authentic performance assessment can be planned. If the learners are able to transfer their knowledge and skills to a new situation to solve a problem or create something new, the teacher can know beyond the shadow of a doubt that the learners truly understand, and will be able to recall that learning and apply it whenever needed. To me, this is innovative, transformational learning – whether technology is used or not. Quite possibly, an authentic task will require the use of technology – as these are real-world tools. But it is not the focal point of the learning. Recently, I had the opportunity to observe a group of 6th grade science learners engaged in this kind of transformative learning and performance task. The teacher, Laura Murray, had created a unit using Intel Education Transformation Model – a backwards design process. According to the Colorado Science Standards, students need to be able to understand that objects, processes and events are systems that consist of interacting parts, objects and events can be viewed at various scales, and that change follows patterns that can be directional, predictive, and/or cyclic. Students are to learn about the constructive and destructive earth processes. Laura’s backwards plan was able to address these understandings and big ideas, and culminated in a performance based assessment where students had the opportunity to apply their understanding in a unique way. Students assumed the role of museum curator –in the far away future. They were able to choose –500,000 or 1,000,000 years in the future! Their task: Create a museum display depicting what the landscape of our area of Colorado might look like in that amount of time. Prior to this culminating event, the students spent a good deal of time studying geologic periods. You can imagine, to the typical 6th grader, this can seem very abstract – perhaps even a bit dull. 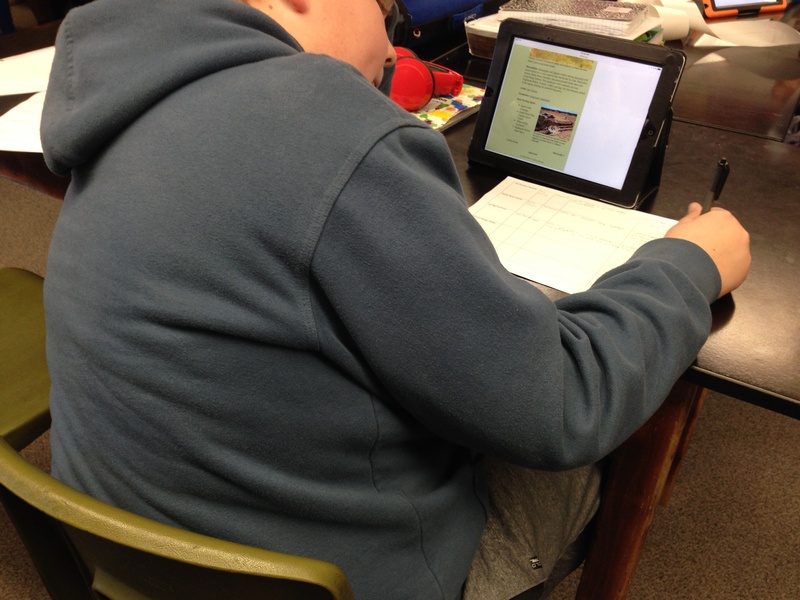 But it really came alive for these learners when Laura introduced them to an online resource provided by the Denver Museum of Nature and Science. They featured a special exhibition on Ancient Denvers: The Denver Basin Project. And –the task that they were given within the role of museum curator was exciting, creative, and engaging. Students had a connection because it was about their own landscape that they were challenged to make a prediction. The students worked in teams to research the exhibits the museum currently offered, read the descriptions, and then used their knowledge and understanding to predict their future landscape. 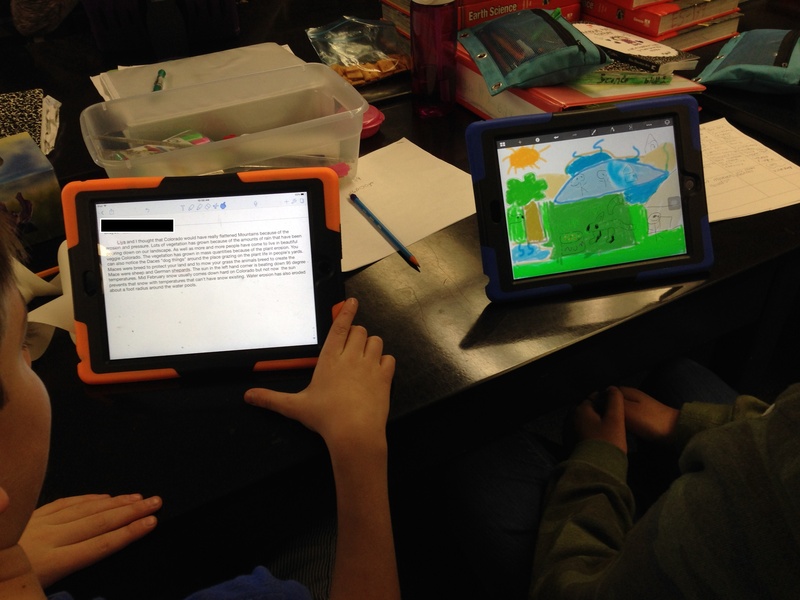 This is a 1:1 iPad school, so they used the iPads to research, draw the landscapes for the exhibit, and write up the description for the museum placard. The day I visited, the students were working specifically on their understanding of scale. 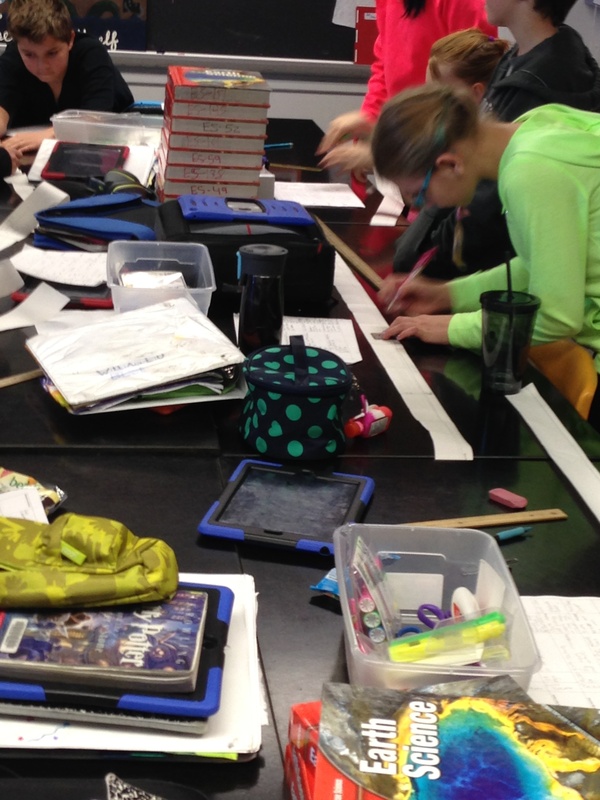 Students were using rolls of cash register tape to physically see and understand the time distance between the geologic periods. They used a scale of 1 millimeter = 10,000 years and had to mark them all out on the tape. One of the things I loved about this as that Laura chose the best tool for the task at hand. Trying to create these models of scale using the iPad might have resulted in students not being able to see the physical distance from one mark to the next, and reduced understanding as a result. What’s next? Seeking authentic feedback from real museum curators at the Denver Museum of Nature & Science. Providing authentic feedback is the finishing embellishment on a unit that provided these 6th grade learners with a transformational learning experience that they may carry with them for a lifetime. Laura has been teaching middle schoolers for 13 years at Academy District 20’s Challenger Middle School in Colorado Springs. She has taught Science and Social Studies in 6th, 7th, and 8th grade. She has earned Outdoor Recreation, Business, and Curriculum and Instruction degrees from Colorado State University and University of Colorado at Colorado Springs. In her spare time, Laura coaches Forensics, is a NJHS sponsor, and serves on many school and district committees. Laura also volunteers with theater programs at Challenger and Pine Creek High School. One of my primary job responsibilities is helping educators in my district to innovate by providing thought leadership and professional development to get us there. We have embraced University of South Florida’s Technology Integration Matrix (TIM) as a way to help teachers understand the different levels of technology integration, with an eye toward reaching transformation, all while understanding that not all teaching and learning will fall into this category. Much like with the Rigor and Relevance Framework created by the International Center for Leadership in Education, we recognize that learning brand new content often occurs in Quadrant A, or, on the TIM, in the “entry level.” We explain that we hope teachers can increase the frequency of teaching and learning that occurs in Quadrant D of the Rigor & Relevance Framework, or transformative teaching and learning in the TIM. But lately I’ve been wondering, will this get us to innovation? Or, will we have teachers that will be content with the low-hanging fruit – which would be Quadrants A & B, or Entry/Adoption? The two models are different, in that the TIM focuses on levels of technology integration –the strategy for learning, rather than describing the learning. TIM is all about how the tools are being used – not on the results they produce. It is about inputs. The Rigor & Relevance Framework describes what the students are doing, and the outcome. As I look at these models and reflect, I wonder if transformation, as described by TIM, is enough for innovation. 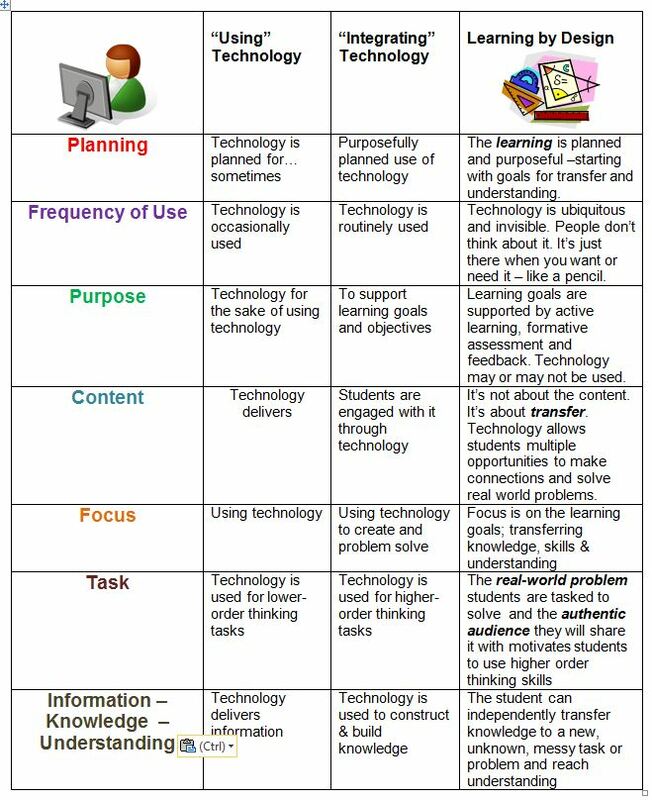 (See https://nancyweducationinnovations.files.wordpress.com/2013/05/technology-to-learning-design-chart.jpg) For instance, if we are using technology in transformative ways, but it is only for acquisition or application of knowledge, or is limited to one discipline, can we even describe this as transformative, in terms of the impact on the learner? Let’s face it, educational technology departments are stretched pretty thin, and so much of our efforts are still being spent on just trying to get more teachers to use technology. But to obtain the level of innovation that we seek, transformative learning that will prepare our students for an “unimagined future,” a systematic approach is needed, that meets teachers where they are, and consistently moves them forward in both pedagogical and technological knowledge, so that they can achieve the sweet spot described in the TPACK model –Technological, Pedagogical Content Knowledge. We can’t just focus on TIM, because that is only about inputs. To really achieve innovation, I believe we must also use the Rigor and Relevance Framework and backwards design process outlined in Understanding by Design, which includes setting learning goals for transfer. Underlying truly meaningful and deeply skilled teaching with technology, TPACK is different from knowledge of all three concepts individually. 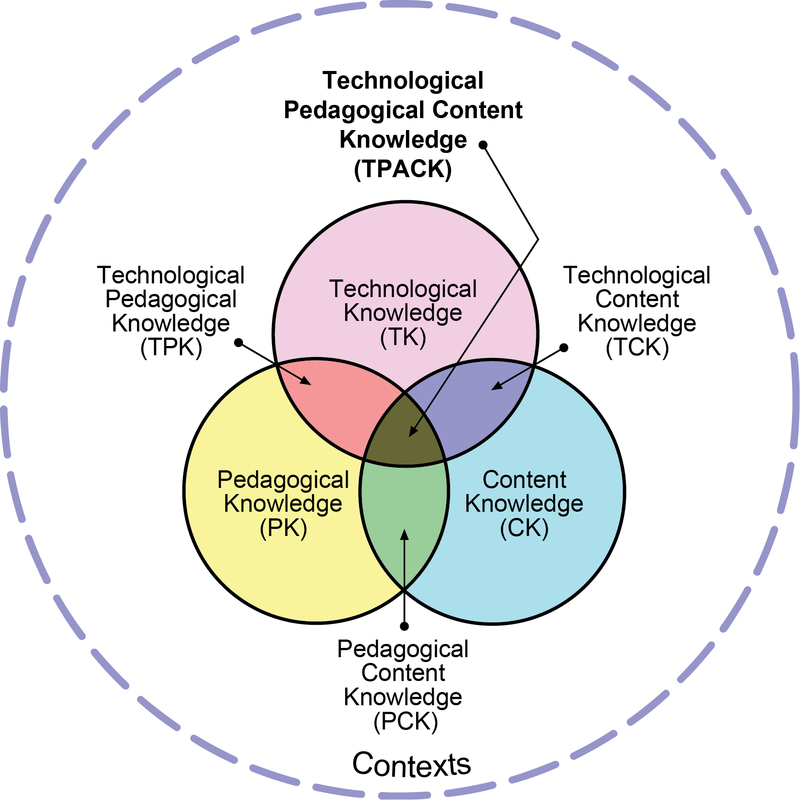 Instead, TPACK is the basis of effective teaching with technology, requiring an understanding of the representation of concepts using technologies; pedagogical techniques that use technologies in constructive ways to teach content; knowledge of what makes concepts difficult or easy to learn and how technology can help redress some of the problems that students face; knowledge of students’ prior knowledge and theories of epistemology; and knowledge of how technologies can be used to build on existing knowledge to develop new epistemologies or strengthen old ones (Koehler & Mishra, 2009, accessed at http://tpack.org/tpck/index.php?title=Main_Page). I love the Understanding by Design (UbD) method for planning learning with the end in mind. This makes perfect sense, no matter what you teach – if your goal is to make sure that your students learn. (it’s not enough to say you “taught” it.) In my case, my learners happen to be teachers, and so modeling backwards planning when designing professional learning is essential. Currently, I am working on a plan for professional learning to support teachers who may pilot 1:1 through BYOD “Bring Your Own Device” in their classes next year. 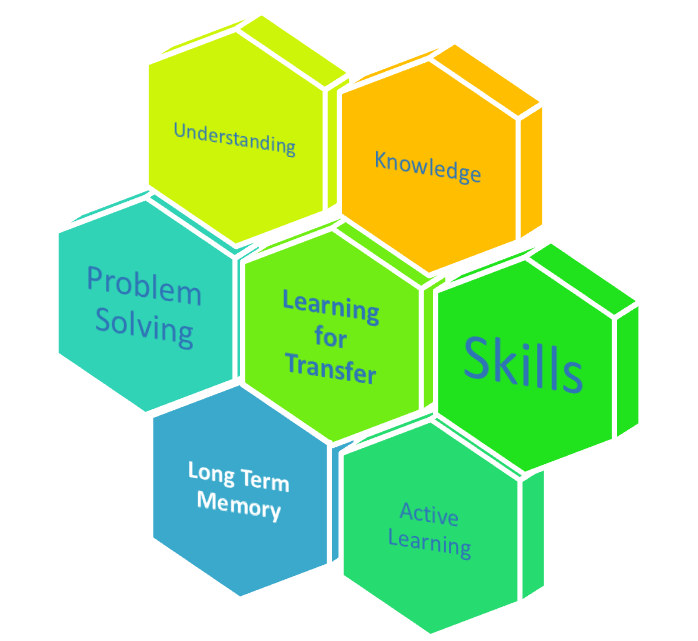 In UbD, Stage 1 involves identifying the learning goals for transfer, understanding, knowledge, and skills, and an overarching essential question that can drive the learning. I love how thinking through these learning goals can spark ideas for the “performance assessment” – which in this case will be the teachers designing learning that is focused on learning goals, and then designing a performance assessment and activities to support those goals – which is where the technology comes into play. Here are the goals I’ve drafted–what would you add? Teachers create learning ecosystems that motivate students to own the learning by using technology to support deeper, more personal learning. Essential Question: How can we make the learning ecosystem meaningful for each individual learner? 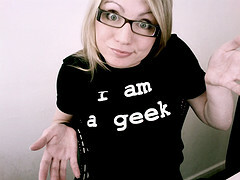 Teachers: Get your Geek On! I’ve been reflecting on a question recently asked by THE Journal: What are the top 5 tech skills every educator should have? I struggled with this question because what I have come to understand is that powerful learning is not necessarily about the technology. To be effective in creating a learning environment where students can practice 21st century skills, the emphasis must be on good instructional design –backwards design, that begins with the learning goals aligned with the standards, with a real-world or scenario based project or problem to solve that kids can connect with, be motivated by, allowing them to demonstrate transfer and understanding. So, while this description of “geek” really tops my list of “tech” skills teachers need– I do offer 5 qualities below that I believe are essential for educators to be successful with technology in their learning environments. In today’s rapidly changing world, (which eventually –will catch up to the world of education!) teachers need to be life-long learners. They need to wonder about what tools can best meet the learning goals – or extend the learning in powerful ways. They need the mindset to be able to seek out the tools, and explore them with a sense of wonder and curiosity. But, if they lack this general curiosity and desire to learn, they will never know the possibilities –and neither will their students! Self-Efficacy: Our belief in our ability to succeed in certain situations. Above all, I believe teachers must believe they can be successful with using technology to be able to meet learning goals for kids. Part of this is self-confidence, but it goes beyond that to be able to actually design learning creatively to use technology to help students learn in ways that wouldn’t be possible without it. Teachers also need to know when to throw in the towel and switch to a different approach if something isn’t working. Also, sometimes technology isn’t the best course of action—and so when technology is merely replacing an old practice – and the tech isn’t working, don’t get flustered! Use whatever tools are available to accomplish the learning goals! Why would this be a technology skill, you ask? According to data from comscoredatamine.com, Nielsen.com, Tnsdigitallife.com & Pewinternet.org, as displayed on this infographic, when people are online, 21% of that time is spent searching, 20% reading content, and 22% in social media. If US Internet users are online 32 hours per month (and I think that is on the low end), that’s a heck of a lot of time encountering information which may or may not be relevant or reliable. Teachers need to have this important 21st century skill so they can constantly model it, teach it, and assess it –for the purpose of giving students feedback, so they can get better at it. My hunch is that the amount of time our kids will spend online will continue to increase dramatically throughout their lives. Without information literacy, and a critical stance towards the information they encounter, they will be less successful in their future and less productive members of society. Author Nancy WhitePosted on 10/25/2013 Categories Reflection, technologyLeave a comment on Teachers: Get your Geek On! This week, we launched our Creating Innovators Grant Project and I am really excited about the possibilities. The project involves peer coaching, where some of our most creative and innovative teachers have agreed to mentor 2 teachers in their schools who otherwise would probably not have volunteered for this kind of in-depth professional development. The mentor teachers applied to participate, and were selected not only based on their own creative teaching talents, but from an expressed desire to learn and grow themselves through the experience. Our hope is to move not just the “mentees” forward as designers of learning, but their mentors as well. These teachers have been very successful with integrating technology in a blended learning model, but as a district, we have not entirely identified where we want to go with this new way of teaching. Is it merely to assure all students do well on standardized tests and get into good colleges with good grades? Or is our purpose for blending learning something greater? Blended learning has the potential to go beyond merely meeting the goals of standardization. I hope that through our approach in this grant project, our mentor teachers will also come to understand that blended learning is only the first step in transforming the classroom learning experience for their students. Blended learning can lead to personalizing learning for students – towards the end goal of creating innovators. Technology is just one powerful tool of blended learning, but technology alone is not going to get us there. Teachers must become designers of learning. 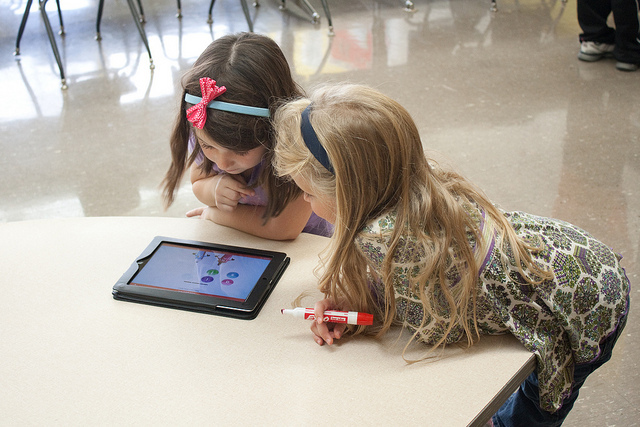 Technology allows them to alter more than just the time, place and pace of learning. Technology can help teachers design learning that alters the path of learning. Technology can help them design learning that is tailored to students’ passions. With standards as the baseline, there are an infinite number of paths that can lead students to mastery and understanding. Transformation in learning will occur when we use technology to create different paths for students – paths that help students find and follow their passion. Transformation can occur when creating innovators is our goal. 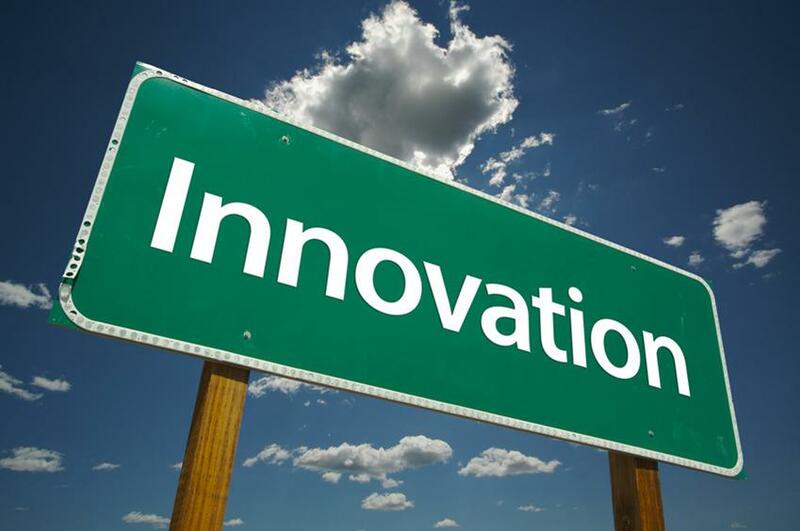 The title of this grant project says it all: Creating Innovators. It has a double meaning, as we hope to create innovators of both our teachers, and our students. To create innovators, we need to foster play, passion, and purpose, as our teachers will learn through a book study of Tony Wagner’s book Creating Innovators. We will use these strategies first with our teachers. How are you using technology to provide different pathways for student learning? Click here to share your ideas or successful practices. In my next post, I will share how our professional development for the mentors and mentees is modeling play, passion & purpose. I decided to take a closer look at each of the elements in this chart and translate to the situation at hand. 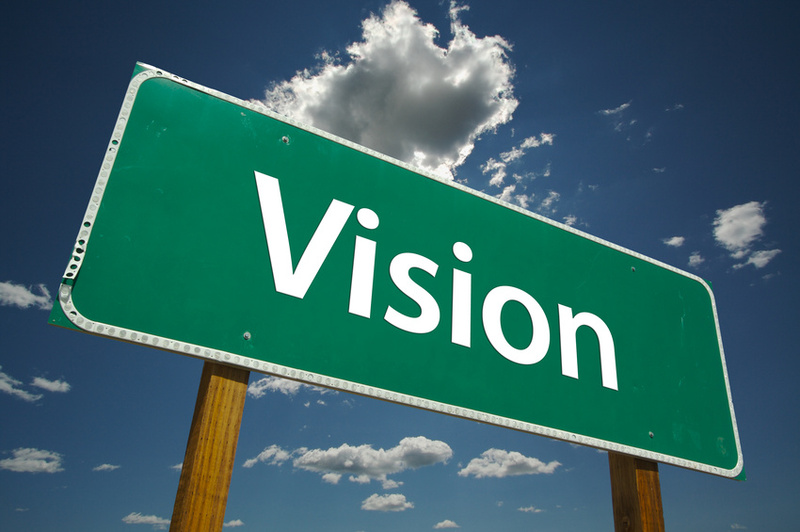 Without vision, confusion is the result. In our IT-Education Services department, we continuously share our vision that technology is not the “end” – but rather the tool that will allow teachers to transform learning for students. We are working on a plan to use the Technology Integration Matrix developed by the Florida Center for Instructional Technology to help them understand the vision of what transformation looks like. The matrix contains links to excellent short videos that show various levels of technology use and depth of learning across all subject areas and grade levels. Without skills, anxiety is the result. We are beginning to outline a plan for professional development for teachers who will be in the 1:1 pilot using the Understanding by Design model. Thus, we are starting with the end in mind –our overall transfer goal of students using the technology at the point of need to connect with the “real world” and to allow choice in how they learn as well as in time, place, path, and/or pace in learning. (Innovative Innosight’s Blended Learning Model). In following the UbD 2.0 Template, we are also identifying understandings, knowledge and skills that teachers will need to be successful with achieving the long-term transfer goal and vision. We recognize that skills with using the technology are just as important to address as the vision and goals, and that we will most likely be working with teachers who are at many different levels in terms of their current skill and comfort level of using technology. That is where the Technology Integration Matrix will come in handy – so that we can let teachers self-evaluate where they are currently in their practice, and then we can plan a tiered approach to the professional development to meet them where they are and help move them to the next level. Without incentives, change is more gradual. In our situation, offering any kind of monetary incentives to teachers in the 1:1 pilot to learn new skills and pedagogy is probably not going to be possible. We will do the best we can here, getting an iPad in their hands well in advance of deployment with students so they can begin to get comfortable with the technology. Additionally, we always make it possible for teachers to earn professional development credit towards recertification and incremental salary increases. The thing is, we usually find that access to the technology itself for the teacher and their students is a HUGE incentive – for perhaps all except for the laggards (on the Diffusion of Innovation scale). We realize that resources can be everything from people (tech support) to tools, accessories, apps, best practice information, and robust networks. Our 1:1 plan does call for beefing up the network in the pilot schools, and we will be sharing app information via our district’s iPad User Group wiki. One of our biggest areas of concern, however, is tech support. The district has invested in 2 additional positions at the district level, but it will be up to the individual schools to decide whether or not to add additional tech support at the building level. The action plan is currently being written. We are linking this closely with the vision, objectives, tactics and action plan developed by the schools for learning and student achievement in general. I’d really like to hear from anyone who has already implemented a 1:1 with iPads about what worked and what didn’t. Innovations In Education Blog at WordPress.com.